I have to admit I was a little nervous. 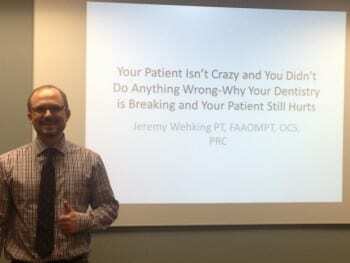 I was presenting to a group of really great occlusally minded dentists. This was for the International Partnership for the Study of Occlusion (IPSO) study group. These people are awesome, they really know their stuff. I was excited to talk to them about my approach to TMD (temporomandibular disorder) patients, and how physical therapy can help. They were really welcoming and I enjoyed presenting. It can be difficult treating complex patients, especially when there is a need for good communication between professions. It’s common for patients with craniofacial pain and TMJ issues to need help from multiple professions, and this can be helped with good communication. These patients have usually been through the ringer and have looked high and low for help. That’s why they are some of the most rewarding patients to work with. I have found it extremely helpful to pull from multiple schools of thought when it comes to helping out on the physical therapy side of things. It is really amazing how much one part of the body can, and often times does, influence another part of the body. That’s why I was really honored to be presenting to this great group of dentists. 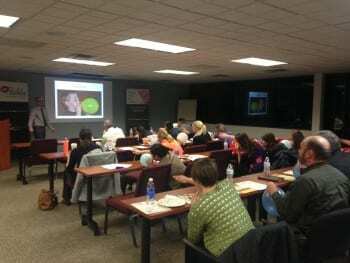 They treat folks like this on a regular basis and I was pleased to be presenting to them.